Star Wars and LEGOphiles can hardly wait for summer to end, because September marks the release of the new Star Wars Ewok Village set. The Star Wars-licensed LEGO set brings collectors to the moon of Endor, with a deluxe multiple treehouse set, complete with all the essential characters. The 2,000-piece set will include 16 mini figures, including main characters like R2-D2, Luke Skywalker, Princess Leia, Han Solo and three brand-new Ewoks made with the famous toy brick. The Ewoks’ forest abode is recreated with cool features like a tree-trunk hideout, spider web, net traps and a slide for quick getaway. No stand-off would be complete without the secret Lightsaber stash and catapults, and the set even has a rammer function to take out the Trooper’s speeder (which is also included). 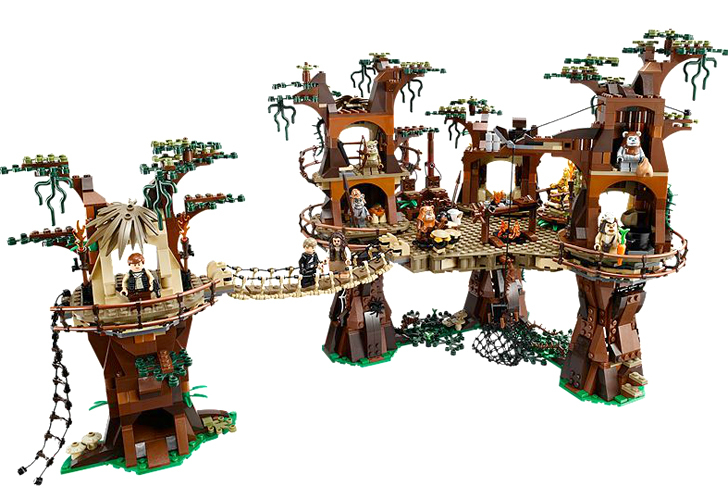 LEGO has outfitted the set with even the most minute details, like LEGO trees and leaves to set the stage in the Ewok forest. Two Scout Troopers and two Storm Troopers add to the battle, as do rebel soldiers, C-3PO and a new Chewbacca. Five Ewoks can take turns on the elevating throne in the center of the village. Originally set to be released this spring, the much-anticipated Star Wars Ewok Village set won’t hit stores until September 1st. Each of the oversized kits will set you back $250, but the more than one-foot-tall collection includes everything from rope walkways to vines, weaponry and essential characters. Originally set to be released this Spring, the heavily anticipated LEGO Star Wars Ewok Village set won’t hit stores until September 1st. Each of the oversized kits will set you back $250, but the expansive collection includes everything down to rope walkways, vines, weaponry and essential characters. The Ewoks’ forest abode is recreated with cool functions like a tree-trunk hideout, spider web, net traps and a slide for quick getaway. No stand-off would be complete without the secret Lightsaber stash and catapults, and the set even has a rammer function to take out the Trooper’s speeder (which is also included). 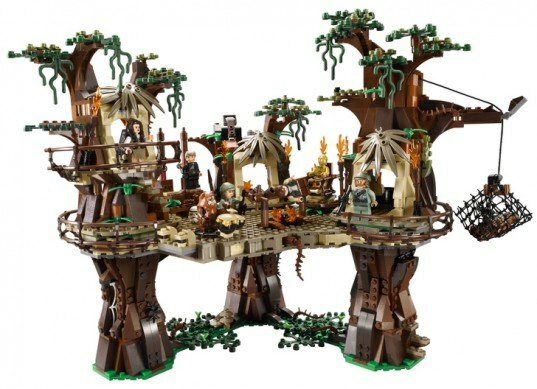 LEGO has outfitted the set with even the most minute details, like LEGO trees and leaves to set the stage in the Ewok forest. Two Scout Troopers and two Storm Troopers add to the battle, as do rebel soldiers, C-3PO and a new Chewbacca. Five Ewoks can take turns on the elevating throne in the center of the village. Appealing to collectors everywhere, the LEGO Star Wars Ewok Village lets kids and adults recreate their favorite scenes from Episode VI : Return of the Jedi…but not until fall!